Here’s an AC Transit story from Amanda, the human behind the nascent @actdiaries. Follow AC Transit Diaries, the latest in the Diaries clan (which includes @caltraindiaries and @bartdiaries). A few months back during my transbay commute I changed things up and sat near the front of the bus instead of the center aisle, my usual. When we stopped at the Grand Lake Theater a helmeted bicyclist attached his bike to the front of the bus and sat down casually near the driver. The bus pulled away from curb and onto the 580 onramp without a hitch. From where I was sitting I watched the bus driver hover above her seat with her foot on the gas inspecting the bike rack. While a near standing bus driver was odd, I rationalized that it must get really uncomfortable to be sitting all the time. The bus continued to accelerate and we merged to the furthest left lane, which was still totally normal for our route. I looked at the bike guy who now was wearing headphones and motioned that the bus driver was yelling at him. The rider pulled out an ear bud and made a “Who me?” shrug and and sheepishly walked next to the driver. “You didn’t attach your bike correctly!” She yells frantically. “See, its not on right!” she shakes her finger at the bike rack. As the bicyclist starts to mutter a response, the driver checks the side mirrors and brings the bus to a screeching halt on the freeway. Everyone on the bus, people who are usually quite chatty, go silent. I look around and notice that we are parked in the fast lane; our driver didn’t even bother to pull over onto the shoulder. She unbuckles her seatbelt and stands confrontationally next to the bike rider. She reaches over and presses the button that opens the door to the bus. Oncoming traffic is whizzing by. She points out the door demanding the bike guy exit the bus and retrieve his two-wheeled ride. The rider backs up and sits back down, his own personal protest. The bus driver sneers as us and leans out the open door, checks for oncoming cars, and shimmies spy style around the nose of the bus. Everyone starts really FREAKING OUT. People are now crowding the front of the bus to witness what may be this bus driver’s impending death. I watch her wiggle the bike on the rack and then heave the bike frame over her shoulder. 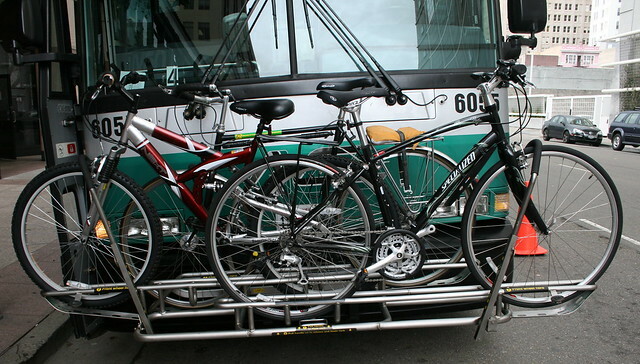 She barrels back into the bus carrying the bike and shoves it in the sitting rider’s direction. He catches it. “Guess the rack was broken” she mumbles, turning the ignition. That is an insane story!!! This AC Transit driver must have a death wish and the best life insurance policy in the industry! can you give me a date for this story about the bike rack?I cannot imagine a driver doing this and I would liek to investigate this story.